Adopt free virtual pets at Chicken Smoothie! Collect new pets every month, watch them grow, dress them up and trade them with friends! Create artwork using our free online Oekaki app, and join clubs, roleplays, and discussions in the Forum! Get started right away by clicking the "Adopt" button above! How are you enjoying the Easter Hunt so far? Don't forget to grab Totoro's free gifts each day! Our Easter Hunt has begun! Is this your first Easter on CS? Make sure you read all the instructions on the Event Page and in the news. This event is very similar to our Halloween candy hunt. 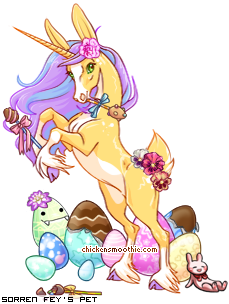 The Easter hunt is a special event where you can collect eggs from around the site and forum, and then trade them in for cool pets and items. To collect eggs look for special prize banners which sometimes appear at the bottom of the page. They could appear on any page on Chicken Smoothie, so browse around! You might have to hunt for quite a while before you find the prize banner, but don't give up! When you do spot a prize banner just click it to claim your egg. Once you've found an egg you have to wait at least 20 minutes before you can hunt again, so take a break and come back later. When you have enough eggs you can choose a prize on the Event page! The event runs for about 10 days. Each day there will be new prizes available, and sometimes there will also be free gifts which you can get without spending any eggs! Don't forget to check the event page every day and remember to hunt for eggs when you've got time! The prizes on the event page will all be available for the full event, so if you want you can just save your eggs for now and make your choices at the end. Click here to enter your pets in the Easter Dress-ups Challenge! Happy 11th Birthday, Chicken Smoothie! The very first CS pets were created 11 years ago, in April 2008. That's older than some of our members today! We owe a huge thank-you to all our supporters who've brought us here. Today let's remember to honor our generous team members - past and present - who've helped build an awesome safe community and filled our collections with gorgeous pets and items. And of course we owe thanks to our wonderful members, who warm our hearts each day seeing you develop and share new skills, friendships, interests, and entertainment. Help us unwrap our Birthday Gifts! Join the Birthday Dress-ups Party! And this year may be your chance to join the CS Team! Answer our 11th Birthday Quiz! We're also announcing some new Oekaki features today, check out our announcement on the forums for more info! We hope you enjoyed our April Fool's Day silliness yesterday! After practicing on all those hair models, Totoro graduated hairdressing school! She's made her styling services permanently available with a new free item pack in the Store! If you want to keep your fierce afrovatar you can now find them in the Avatar gallery (in the "Derp" category) and in the Stamp Collection (in "Holidays & Events> April Fools"). Don't forget to enter this month's Dressup Challenges! And later this month we will be celebrating CS Birthday and Easter, so remember to check back soon!